This has probably been the best season of Dexter yet thanks to John Lithgow’s portrayal of the Arthur Mitchell and the many twists this season. Twists include finding that, just as the Foundation and Hitchhiker’s Guide to the Galaxy Trilogies wound up having more than three books, the cycle of the Trinity killer contains four rather than three killings. Last week’s key twists including the suicide of Christine after confessing to shooting Lundy and Debra, and the ending in which Mitchell discovers Dexter’s identity. Even bigger twists are likely to be present tonight. Julie Benz (Rita) has hinted at a shocking ending. Jennifer Carpenter, Michael C. Hall’s wife in real life and sister Debra on the show, has also said that Dexter will never be the same and warns that “maybe all of our trailers won’t be there next year.” She also hinted at changes in an interview with E! I have to give a lot of our fans credit. The stuff that they come up with and the guesses that they make on how it’s going to end are really impressive, but you just can’t top our writers. All the time you put in [episodes] one through 11 watching the show, you’ll be glad that you did in 12. Everybody matters in the end. Everybody matters. We all had to be there to shoot the finale. How does it set up season five? At the end of every season, collectively, the writers, the producers, the actors, we all sort of cry, “What are we gonna do next year?” And this season it ended and everybody said, “Well, what can’t we do next year?” I know the mold is sort of breaking and that’s an exciting thing. I think people are kind of getting comfortable sitting in their living rooms with a serial killer, and my hope is to make him more dangerous. Will Deb find out about Dexter’s mom? It seems like she’s getting close. They’ve been sort of unraveling that cord for four years now, so I can’t say that anything is finished. That’s sort of the brilliance of the finale and the twisted psyche of our writers. It’s sort of epic and vast, and it all counts. I feel like a lot of viewers are waiting for the big payoff, the big reveal when Deb finds out, but I think it will be more exciting and feel more dangerous if the blanket’s not just ripped off the secret, if it’s slowly discovered. So I guess we’ll all get there someday. 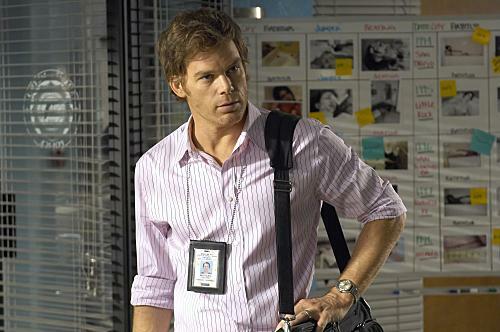 Do you think Deb will ever discover Dexter’s big secret, that he’s a serial killer? Personally, being a player in this game, I want to see it happen, partly, just because I’m curious. I think I know Deb as well as anyone, and I think they [the writers] would claim to know her just as well, and I’m interested to see if we’re all on the same page about what it would look like. We all throw around ideas just for fun when we’re waiting on-set, or even after when we’re on hiatus and all hanging out as friends we all say, “Well, what if this happened?” and “What if that happened?” And I have real responses to what people say. I get angry about it; I get hurt about it. I get protective of it. So I’m ready to go in any direction that they tell me to move, but I don’t think you can tease an audience the way we have about her getting close to it without giving them the payoff, whatever it is. Word is, there will be a turn so unexpected on Sunday that it will change the whole series. Not surprising, considering this is “Dexter” we’re talking about and the season has been loaded with twists. A finale that doesn’t trump what’s already gone down would probably be considered a disappointment by fans. But if the intense measures that Showtime has taken to protect the secrecy of what’s in store are any indication, there’s not much for viewers to worry about. We’re told non-disclosure agreements were signed by everyone on staff and at the network, decoy scripts were drafted and disseminated, each and every screener was watermarked and sets were closed to anyone that didn’t absolutely have to be around during shooting. It is quite possible that whatever happens is totally different from the ideas I’ve speculated on during the season. The writers really do seem to be well ahead of the fans. Considering the degree to which Rita has hindered Dexter this season, I wonder if she winds up getting killed by Trinity, or winds up leaving Dexter. Perhaps she’ll discover his secret. The character who is even more likely to figure it out is Debra, perhaps as a consequence of both going after the same killer. In the clip above she has learned a little more about Dexter’s past. In the first novel, which was similar to the first season of Dexter, Debra did wind up learning Dexter’s secret. The success of this season is largely due to John Lithgow’s portray of Arthur Mitchell, the Trinity killer. There is really no point in even bothering to nominate anyone else this season for best supporting actor in a drama. In the above video, Harry Smith interviewed John Lithgow about playing the role. The video includes a short clip from the finale which gives a clue as to what happens during the confrontation between Dexter and Arthur at the conclusion of last week’s episode. Update: I’d been expecting this for several weeks (as I predicted here) and the episode certainly foreshadowed such a development (unless you really believed Dexter was just going to settle down). Showtime certainly had a great night with cliff hangers, both on Dexter and Californication. Both endings should increase interest in next season. Law enforcement is not saying a lot about its social surveillance, but examples keep coming to light. The Wall Street Journal reported this summer that state revenue agents have been searching for tax scofflaws by mining information on MySpace and Facebook. In October, the F.B.I. searched the New York home of a man suspected of helping coordinate protests at the Group of 20 meeting in Pittsburgh by sending out messages over Twitter. In some cases, the government appears to be engaged in deception. The Boston Globe recently quoted a Massachusetts district attorney as saying that some police officers were going undercover on Facebook as part of their investigations. Wired magazine reported last month that In-Q-Tel, an investment arm of the Central Intelligence Agency, has put money into Visible Technologies, a software company that crawls across blogs, online forums, and open networks like Twitter and YouTube to monitor what is being said. We are in a different world than Orwell envisioned, and a different world from when the privacy laws were written. If someone is dumb enough to post about breaking the law on a public site that might be comparable to admitting one’s crime in a public square and the police might not be blamed for listening in and taking action. Things get more complicated when police enter closed sites under false pretenses.